Rise of the Northmen társasjáték - Magyarország társasjáték keresője! A társasjáték érték! A Rise of the Northmen egy remek társasjáték, 2 - 3 játékos részére, az átlagos játékidő 1.5 óra. A társast, 12 éves kortól ajánljuk kipróbálni. A játékmenet erősen épít az akció pontok, a terület mozgatás és a terület befolyásolás/irányítás mechanizmusokra. 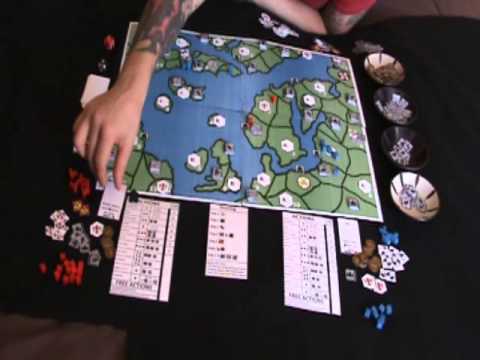 Rise of the Northmen is an action point allowance game in which 2-3 players expand their own viking tribes and conquer new lands in search of riches and glory. There are three main sectors on the map, from east to west they are A, B and C. The greatest rewards can be found to the far west in the C sector, but they are also the hardest to reach as they require long journeys across the sea. 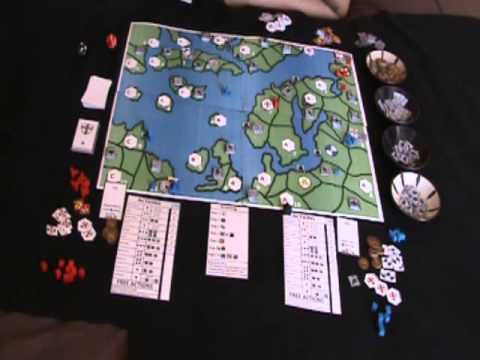 Each player starts the game with 3 vikings on the board, 2 steel and 2 food tokens, 5 ship tokens and 12 vikings in reserve, and 10 shield tokens. 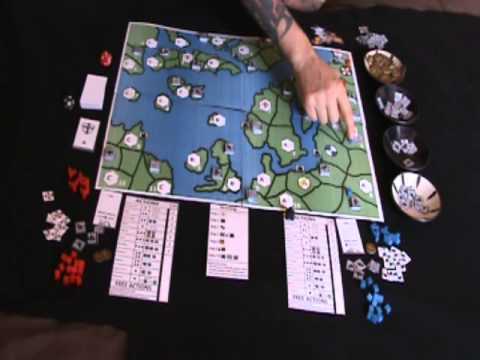 During each turn players will each have 7 action points they can use for movement, harvesting resources, razing villages, building ships and sailing, constructing runes to the gods, and attacking each other, all of which offer varying victory point margins. 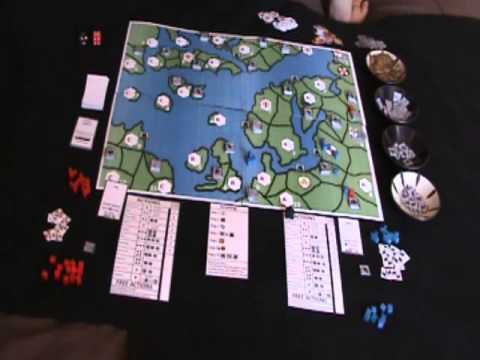 Many of the actions require resources and troops to complete, requiring players to plan ahead in order to carry out their turns. The game is driven by an event deck of 32 cards. At the beginning of each round one card is drawn from the event deck, some random events will help all players and some will hurt all players, most of the events are Crusader cards that correspond to the 3 sectors. When a Crusader card is drawn a die is rolled for its corresponding sector and a Crusader shield is placed in that village, players can destroy the Crusader shields for points and are encouraged to because if a 7th Crusader shield is ever placed on the map then all players lose the game. The game ends when a player places their 10th player shield on a village, or when the event deck runs out. Players then tally their points for player shields, Crusader shields, vikings and ships on the board, runes, money, attack tokens, and so forth, and whoever has the most points is the winner.